In high school, my phone was plugged into a wall. It had a dial on it instead of buttons. Sometimes I would say, “I can’t go out right now. I have to stay home and wait for a phone call." If you showed me a modern phone then, I would have fainted. I might have called you a liar. Libraries of information, a myriad of tools and live video conversations from one affordable device tucked in my pocket? Impossible. Yet the same sort of progress is happening with environmental sciences. The planet that loves the roar of an internal combustion engine, throws garbage into landfills and has no idea where electricity comes from is changing. In not too many years, the world of energy should be getting cleaner and more efficient. The following breakthroughs will be part of the metamorphosis. After a century dominated by fossil fuel-burning engines, the big automakers are finally producing cleaner vehicles. Auto builders are using the easiest form of power: the plugs in our homes. A standard 110-volt socket can trickle charge a car overnight with no new hardware other than a charging cable. A 220-volt plug with an aftermarket charger can do the job twice as fast. Public quick chargers are growing in numbers. Today, one of the most exciting cars to drive on the planet is Tesla Model S P85D. Its lightning-quick throttle response and all-wheel drive delivers a 3.2 second 0-60. For $130,000, it’s making much more expensive supercars look foolish on the drag strip. A used Nissan Leaf costs less than $12,000 and its 80-mile range will satisfy the daily commuting needs of the average driver. Charged in the garage, it costs under $10 to drive all month for most people. For an economy car, the single-speed transmission and electric torque are sneaky quick. These vehicles are for sale today. In the near future batteries will improve in cost, weight and range. The charging infrastructure will expand. The overall cost of electric cars will come down and the quality will go up. Many of the cars on the road, rather than very few, will be burning nothing but rubber. 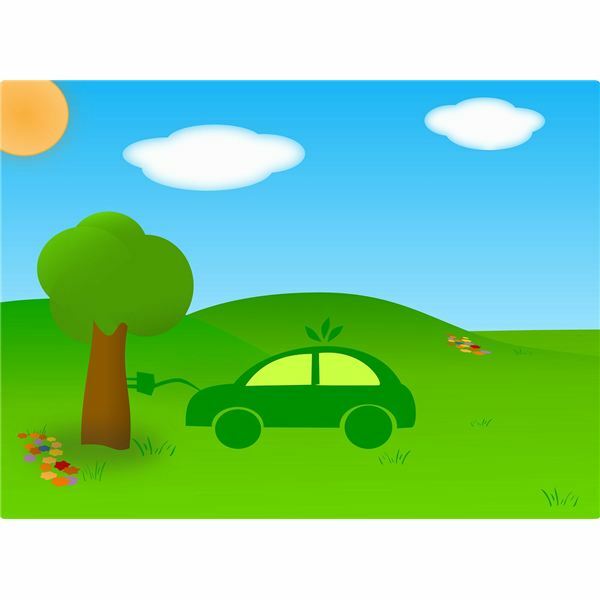 No electric car is truly green if it charges from a dirty grid. That is why it’s essential to charge it with electricity derived from renewable sources. Solar and wind power are the perfect means. When the sun shines on your garage and wind blows past it without being harnessed, you’re wasting that power. The cost of wind turbines and photovoltaic panels are steadily coming down. Many companies in the US are willing to install solar and wind installations with low or zero upfront costs through leases, power purchase agreements and zero interest loans. The government provides healthy tax incentives for green power upgrades. The utility company will send you a check rather than a bill if you produce more than you use. This trend will only continue. Before long, having a roof without a solar panel will be seen as irresponsible. Having a hill without wind turbines will be negligent. Malls, offices and parking lots will see the savings and boost in image caused by green energy installations. The glimmer of solar panels and the twirl of wind turbines will be commonplace. The next question is why are we still constructing buildings and houses the same way? We build a structure to be sturdy and aesthetically pleasing, and then we plug it into the utility system. If we want solar power, we add it to the existing roof. If we want wind power, we stick a tower with a propeller on it in the back yard. Efficient ideas will be designed right into architecture in the near future. Natural light and insulation will be maximized to cut lighting costs and lost heat. The goal will be to produce passive buildings that need little additional power to stay lit and at a comfortable temperature. Many construction materials will be sourced from landfill waste. New carpet can be made from post-consumer carpet fiber. Recycled copper can become shingles. Old newspapers can be used as new insulation. Discarded plastic and wood fibers combine to make decking planks that are more durable and easier to maintain than natural wood. The next generation of homes will be built with sustainability as its central theme. Solar panels will be the roof, rather than an addition to it. Wind power will be integrated. The house will be placed to capture maximum wind and sun. Recycled and reclaimed materials will be used exclusively. Soon a house could be completely torn down, recycled and built into a new, more efficient house. The smallest of plants will be a huge producer of energy in a few short years. Algae can produce clean forms of diesel, ethanol, jet fuel, gasoline, butanol and methane. All of these can replace current fuels. These fuels produce CO2 when burned, but an amount equivalent to what the algae consumes during photosynthesis. Glycerin, a sugar-alcohol, is also produced in the fuel-making process. The Formula E electric racing series uses sea algae glycerin to fuel zero-emissions generators to charge their cars. During a press conference, Formula E president Alejandro Agag and team sponsor Sir Richard Branson both drank a shot of sea algae glycerin. Wastewater can produce algae for fuel. Engineers at Oregon State University have invented a generator that turns wastewater into electricity. Biological waste such as paper, yard trimmings or wood can produce ethanol. Within a decade, big energy changes will come. Fewer cars will run on fossil fuels. Energy for them will come from the sun, wind, algae or garbage. Homes and buildings will be constructed to be green from the beginning. Energy production will be in their soul. Their bones and skin will come from recycled materials. Corporations and governments that cling to old, dirty ways will yield to a public that won’t take that anymore. The technology exists. It needs to be financed, utilized and believed in.